Sharing the facts and busting myths about your hair. It’s our first vlog! My clients are always asking, how can I get my hair to look like it does when I walk out of your salon? To answer that, I’ve created this step-by-step video. Watch as I coach Fix Salon model Stephanie through a do-it-yourself quick blow out at home. Here are a few additional tips to keep in mind. 1. When you think your hair is dry, keep drying. Have you ever taken the time to blow out your hair only to have it frizz out a few hours later? Chances are it wasn’t completely dry. When you think your hair is dry, continue to dry it for another 5 minutes or so. Lots of times there is still moisture in the interior of the hair. Unless all the moisture in your hair is completely dried out, your hair will revert to its natural texture. For the first couple of blow outs, find a time where you are not in a rush and make sure you have all the right tools and products in front of you. You might assume that as a hairstylist, drying my own hair is easy. Believe me, it isn’t. It used to take me 45 minutes to get a perfect finish. Now, because of practice, I can do it in about 20 – 25 minutes. 3. Pick your tools and products wisely. 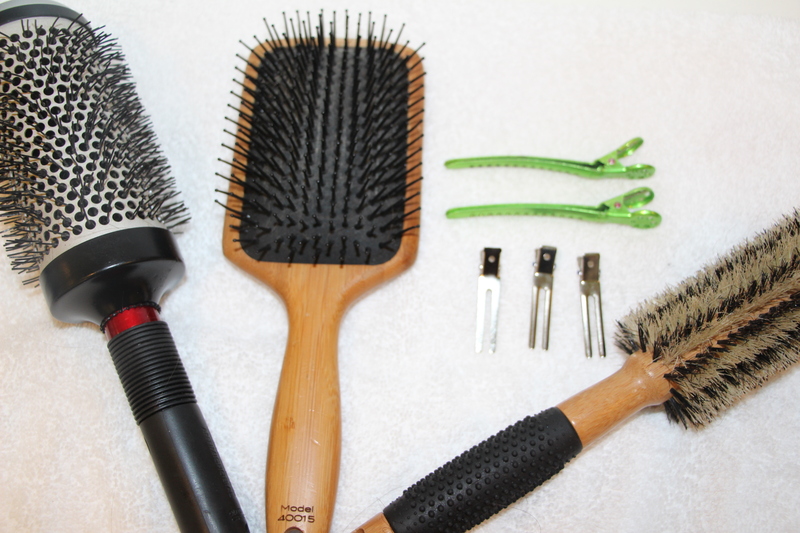 The difference between so-so hair and show stopping hair is highly dependent on the right products and tools. You just can’t get a salon-looking blow out at home without using the same tools used by the pros. For a quick reference of everything we used in the video, see below. All products are available at Fix, either in stock or by special order. If Fix Salon is far from you, you can find these items online. Best brush to turn up the heat–When I need a thermal brush, I go to Cricket. The barrel heats up giving hair that extra polish. To section hair, there are a variety of clips that work well. My favorite salon clips are from Krembs. They are strong and come in a selection of colors. If you have fine hair, small set clips work as well. You now have everything you need to know to get a fantastic looking blow out at home. Want a one-on-one blow dry class like Stephanie had? Give us a call. We do that! Don’t miss another hair post or video. Click the RSS button to get all the hair facts delivered right to your inbox. This entry was posted in Beauty Tools, Hair Style, How-To's and tagged Blow Dry Tips, Fix Salon, Hair Tips Video, Mandy McCullough, Redken, Salon Blow Out Video by Mandy McCullough. Bookmark the permalink. This is great. How about one for shorter styles?